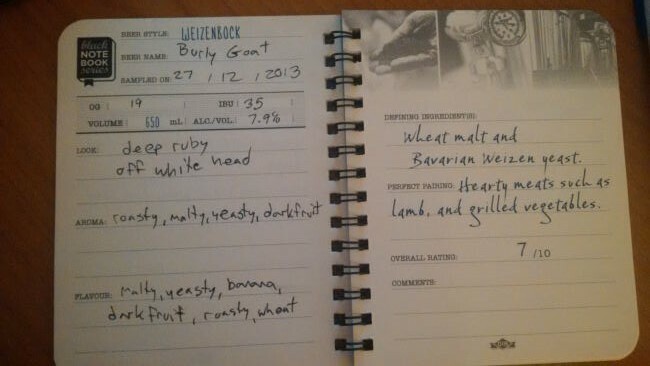 From Granville Island Brewing out of Vancouver comes their new “Burley Goat Weizenbock” the newest addition of the Black Note Book Series form Granville Island’s Vern Lambourne. 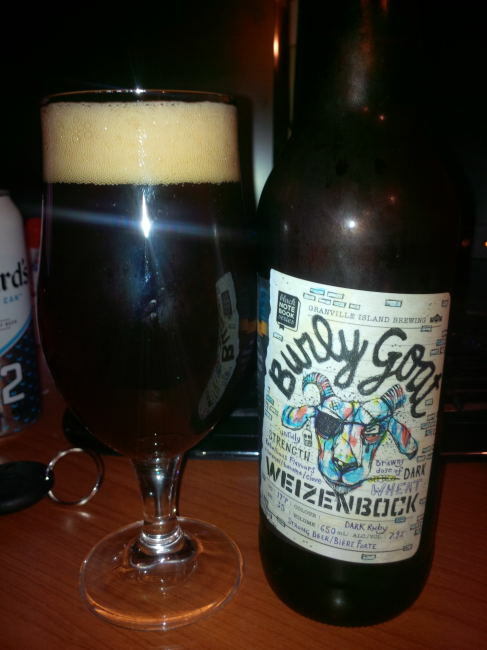 A bock is a darker style lager and a Hefeweizen is a type of wheat beer so this is a combination style the Weizenbock. This beer pours a deep ruby colour with an off white head. The aroma consists of roasted malts, yeast, wheat and some dark fruits. The flavour is of roasted malts, banana, yeast, wheat and dark fruits. The alcohol content comes in at 7.9% with an IBU of 35. Vern has crafted a very good beer with the best characteristics of both styles that are being mixed. Commercial Description: This jacked up beast of a wheat ale is wildly untamed. Full-bodied, full-flavoured and loaded with full-fledged badassery. Deal with it. Food Pairing as per the brewery: The full-on flavours pair nicely with smoked ham or roast pork. Or try it with apple pie for dessert. This entry was posted in Imperial, Weizen Bock and tagged banana, bc, bock, canada, dark fruit, dark fruits, granville island, granville island brewing, hefeweizen, roasted malt, roasted malts, vancouver, weizen, weizenbock, wheat, yeast, yeasty. It does seem like this style is making the rounds. Moon Under Water did this, Granville Island, and I know a few others in the Pacific Northwest. Can you recall any others? Can’t think of any others but I know I have had more.